At present Facebook do not have any feature to download any facebook album with a single click.May be they,get back to it in future(They should!) and downloading the pics of the album manually is such a hard task.But no worries! Today,i am going to tell you How to Download a Facebook album with just a single click.By this method you can download your and your’s friends facebook album just with a single click. Note: You can download any facebook album if you have the permission to access it i.e. the Privacy of the album if it’s set to Public anyone can download your album and if it’s set to friends,your friends can download it.Hope you get my point! 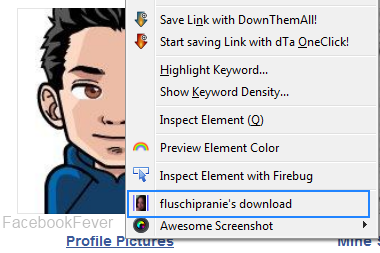 To download any facebook album in firefox,you just have to install fluschipranie addon/extension on your browser.After successfully installed this addon,you don’t need to restart your browser.Now,go to your OR your friend facebook album which you wants to download and right-click on the album link,you will see “fluschipranie Download” option at the bottom. Now,a text field will pop up asking for the prefix for these photos.If you don’t specify any prefix then facebook’s default prefix will be used.After it will ask for the directory to store the downloaded album,just give it according to your preferences otherwise keep it to deafult directory and it will store to your Desktop.That’s it!Isn’t it much easy to download any facebook album with a single click.There are many other apps and plugins to download the facebook album but through them we can download only our facebook album not our friends albums. Which tool/plugin do you use to download facebook albums?Share with us in the comments!Don’t forget to subscribe us to via newsletter to get our latest updates and tutorials right in your inbox!